Australia is the least densely populated continent in the world, apart from Antarctica. As of 2012, most of Australia’s 23 million people live in capital cities, with the rest spread out across rural and remote areas. Land is the largest tangible market in Australia. Peaked at $4.1 trillion in 2010, adjusted for inflation. The land market is around 300% of GDP (a common measure of the economy’s size). The Australian Bureau of Statistics has provided data on land values since 1989, dividing the land market into four uses. 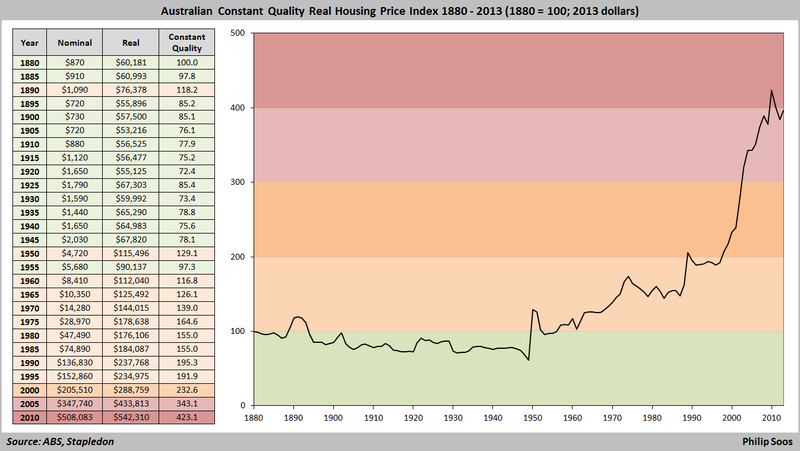 History shows land prices fluctuate continually in boom/bust cycles over decades. A depression occurred during the 1890s when a land bubble centred in Melbourne crashed. It was relatively worse than the 1930s Great Depression. The next major up cycle occurred during the late 1920s, peaking in 1931. The resulting crash was a primary driver of the Great Depression. Land values did not recover until after World War 2 and remained fairly stable over the next two to three decades. The mid-1970s recession was caused, in part, by another land bubble bursting. Yet another residential bubble occurred during the early 1980s, resulting in recession. The late 1980s saw a huge commercial sector land boom. High interest rates eventually burst the bubble, resulting in the early 1990s recession. The largest, sustained increase in land values in Australia began in 1996, centred in the residential property market. This boom dwarfs all previous cycles in size and duration. The boom/bust cycle in the land market has two primary causes. Provides speculators with ample opportunity to profit from increasing land values by quickly flipping land in a rising market as the tax is set too low to subdue speculation. Makes land prices highly volatile, delivering profits to some and losses to many. Ensures speculators will pursue capital gains ahead of rental returns via heavy gearing. Currently less than 1% of the value of land, this tax needs to be much higher to act as an automatic stabilizer, rising as prices advance and shrinking as they retreat to moderate land price behaviour. Financial lenders will often over-extend credit to homeowners and investors so they can speculate in the property market, recklessly endangering both borrower and lender. Based upon past success, speculators commit to higher and higher debt/equity ratios, unaware they are participating in a pyramid scheme. Currently, household debt is $1.3 trillion or 95% of GDP, a staggering financial load. In 2008, almost all mortgage loan offerings were for 80% or more of the property value, and amazingly, 26% of all loans offered were for 100% or more. 60% of investor mortgages are interest-only loans, meaning they depend on rising capital values to make a profit. Substantially increase land taxes while removing 125 other badly designed taxes with large deadweight costs and high administrative burdens. Many of these taxes impact adversely upon labour, making the public poorer. Regulate banks to limit the amount of credit they lend for property purchases. Land value taxes are efficient as land neither moves offshore nor reduce in supply. Rebase the tax system to lift productivity, opportunity and incentives.